The musical score for Rocky was composed by Bill Conti, who previously composed a score for director John G. Avildsen's W.W. and the Dixie Dancekings (1975) that was ultimately rejected by the studio. 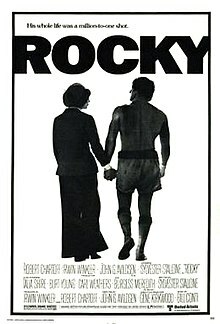 In fact, David Shire (then-husband of Talia Shire) was the first to be offered the chance to compose the music for Rocky but had to turn it down due to prior commitments. Thus, Avildsen reached out to Conti without any studio intervention due to the film's relatively low budget. "The budget for the music was 25 grand," said Avildsen. "And that was for everything: The composer's fee, that was to pay the musicians, that was to rent the studio, that was to buy the tape that it was going to be recorded on." ^ "Chuck Wepner finally recognized for 'Rocky' fame – ESPN". Espn.go.com. 2011-10-25. Retrieved 2012-11-20. ^ McRae, Donald (11 November 2008). "Still smokin' over Ali but there's no time for hatred now". The Guardian. London. Retrieved 3 October 2010. ^ "Star Trek Database – Dorn, Michael". Star Trek Database. CBS Entertainment. Retrieved 10 December 2011. ^ "Stairway to Heaven". DGA. Retrieved 20 June 2013. ^ Neuwirth, Aaron (26 November 2015). "Movie Trivia Thursday (Nov. 26): 5 Cool Facts About 5 Classic Boxing Films". RantHollywood. Archived from the original on June 20, 2016. Retrieved 4 July 2016. ^ "72 Hard-Hitting Facts About the 'Rocky' Movies". Yahoo.com. 2015-11-24. Retrieved 2016-12-10. ^ "Don't Be a Bum, Check Out These 10 'Rocky' Facts". Screencrush.com. 2015-11-23. Retrieved 2016-12-10. ^ "Popculturemadness.com list of 1977 number ones, based on Billboards lists". 1977-07-08. Retrieved 2006-10-14. ^ "AFI 100 songs". 2004-06-22. Archived from the original on October 4, 2006. Retrieved 2006-10-14. ^ "Billboard.com — Rocky Soundtrack". Archived from the original on 2007-05-28. Retrieved 2006-10-14. ^ "Box Office Magazine Rocky Review". 1976-11-22. Archived from the original on November 23, 2005. Retrieved 2006-09-23. ^ "Arizona Daily Star Review". Retrieved 2006-11-14. ^ "Rocky @ BBC Films". Retrieved 2006-11-14. ^ "Rocky, Fargo join National Film Registry". reuters.com. 2006-12-28. Retrieved June 11, 2010. ^ "The 49th Academy Awards (1977) Nominees and Winners". oscars.org. Retrieved 2011-10-04. ^ "AFI Crowns Top 10 Films in 10 Classic Genres". ComingSoon.net. 2008-06-17. Retrieved 2008-06-18. ^ "Mel Gibson's "Braveheart" Voted Worst Oscar Winner". hollywood.com. Archived from the original on 2013-02-03. ^ "AFI 100 Years". 1998. Archived from the original on 2006-08-21. Retrieved 2006-08-24. ^ "AFI 100 Heroes and Villains". Archived from the original on 2006-10-04. Retrieved 2006-10-11. ^ "AFI 100 Quotes". 2005. Archived from the original on September 6, 2006. Retrieved 2006-09-29. ^ "AFI 100 Cheers". June 14, 2006. Archived from the original on 2006-08-20. Retrieved 2006-08-24. ^ "E! Channel's 101 Most Awesome Moments in Entertainment". Archived from the original on 2006-01-18. Retrieved 2015-12-12. 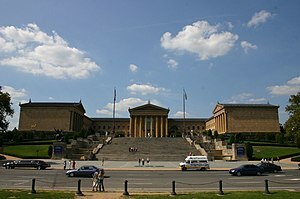 ^ "Philly.com". Archived from the original on December 17, 2004. Retrieved 2006-11-16. ^ "MGM Preparing Rocky Collection on Blu-ray". Blu-ray.com. Retrieved 2010-10-05. ^ "Rocky (Book, 1976)". WorldCat.org. Retrieved 2012-06-29. ^ Grubb, Jeff (Dec 8, 2016). "Rocky Says 'Yo, Adrian' to the Mobile Gaming Market". Fortune Magazine.